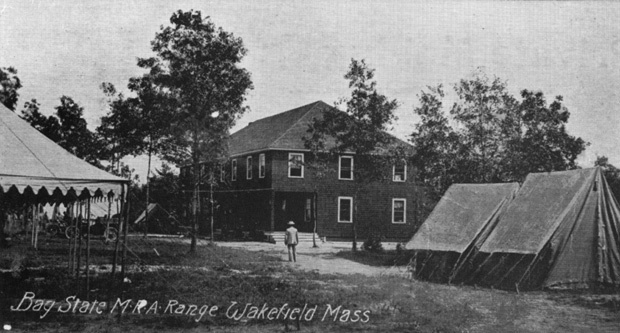 "Located at what is now Camp Curtis Guild, Camp Plunkett was originally owned by the Bay State Rifle Association. During World War I, the camp was leased to the United States Navy and used as a naval rifle range. Many sailors were invited to the homes of Wakefield residents, and townspeople offered them rides as part of the 'give 'em a lift club.' It was during this time that the wooden barracks and the mess hall were erected. At the end of World War I, Camp Plunkett was returned to the rifle association. The Commonwealth of Massachusetts purchased the camp in 1926 for a sum of $65,000 and renamed it Camp Curtis Guild in honor of former Governor Curtis Guild, Jr., 'in consideration of his public service and intimate connection with the military forces of the state and nation.' The camp was called into action during World War II by the First Service Command as a staging area for the Port of Boston. It was also used as a training area for the US Coast Guard. The camp is now home to the Massachusetts National Guard." -- Text from calendar by Jayne M. D'Onofrio. “Camp Plunkett, circa 1917,” NOBLE Digital Heritage, accessed April 22, 2019, https://digitalheritage.noblenet.org/noble/items/show/6888.